The acting Chairman of the Economic and Financial Crimes Commission, Mr. Ibrahim Magu, has challenged a journalist questioning the source of wealth of All Progressives Congress chieftain, Bola Tinubu. He simply asked the journalist to write a petition against Tinubu and substantiate his allegations. 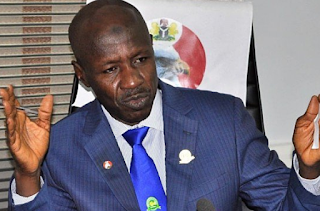 Magu gave the charge in Abuja on Monday while fielding questions from reporters at an event held in commemoration of his third year in office. A journalist had asked Magu when he would probe Tinubu who had purportedly claimed in a video in August that he was richer than Osun State. The journalist also asked why Magu was refusing to answer questions on the video which allegedly captured the Governor of Kano State, Abdullahi Ganduje, receiving bribes from contractors.